Pondering over your perfect honeymoon destination? Let’s talk about Mozambique. South Africa’s lesser known but infinitely more magical neighbour in my opinion, sprawls between Tanzania, Malawi, Zambia, Swaziland and Zimbabwe. Endless white sandy beach, Portuguese colonialism smashing into vibrant Africa, and some of the best marine life on the globe will lure you in. A native friend’s description of it’s magic sparked a curiosity in me that I just had to satisfy, and so with lonely planet in hand, the equally Africa-hungry Mr SB and I set to planning our sub-equatorial adventure! From the time that your flights are booked, you’ll be asked ‘why Mozambique’, and ‘is it safe’. The answer is resoundingly ‘why not’ and not only is it safe, it’s one of the most friendly and welcoming exotic destinations I have ever visited (always check up to date advice from the government website before booking of course)! Our mozambican self-drive trip encompassed equal parts of adventure, mystery and total relaxation. We covered over 2000km of ground, and discovered a stunningly diverse country from remote villages, Robinson Crusoe-esque beaches, majestic marine life and jungle adventures. From the windows of Suzi, our beloved and much needed 4x4 pick-up we traversed south to north and back again, taking in remote lakes, bustling towns and villages of woven huts, bouncing up and down tracks and sandbanks without a hitch and I highly recommend you choose this way to see this African king. Flying from London in mid-September we quickly found ourselves completely decompressed and entirely encamped in another world. Welcome to Mozambique! Maputo and its beating African heart will indeed help you understand the Mozambican way of life, just as the guidebooks suggest. The city still harbours the ghosts of it's civil war and communist past. It's sprawling with no real centre to explore, and seems rightly more concerned with commerce than tourist beautification, however our perfectly formed trip was not a day too short nor long. Day one found us going for full immersion on foot in the Baixa, before sipping our first caipirinha in the grand, colonial Serena Polana Hotel, where our first taste of Mozambican prawns set the tone for all culinary delights to come. Day two arose and we whiled away the mid-day sun loading vitamins into our bodily temples at the ultra hip CK Café. Dhow Café, took in the hauntingly mystic railway station, and sipped sundowners back at the Serena Polana before dinner at buzzy Zambi restaurant completing our Maputo experience perfectly. After a very interesting journey getting lost in the dark trying to find our lodge for the night, (our fault, silly unprepared westerners! ), we woke up to the most spectacular dawn view with flamingoes flying overhead, serenely calm waters and total, blissful quiet. Our stay here was short, but had enough of an impression on me to name one of my ready-to-wear dresses after the location, so you get the picture! The 'Just in Time' resort, our home for the night, turned out to be true to it's name when the lodge-keeper had to come out to rescue us right before we drove into the lake around which Bilene wraps. 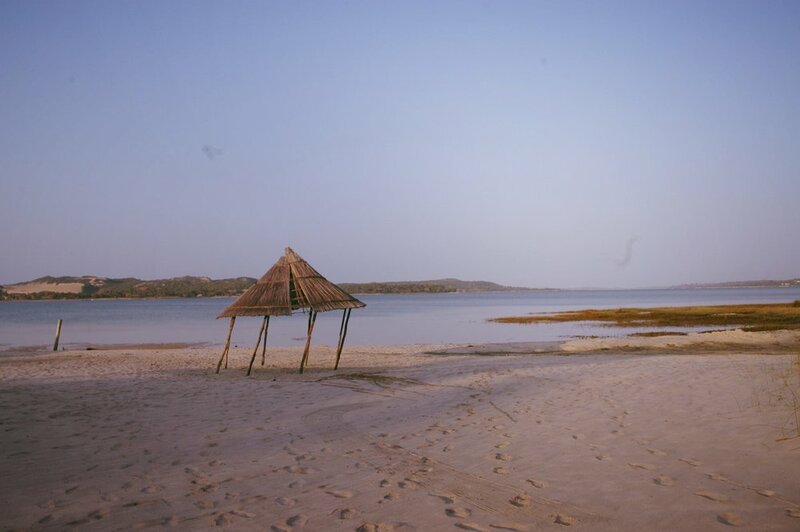 A quiet beauty, untouched and unspoiled, Bilene gave us a taste for discovering what else Mozambique had to give. We fell in love with Tofo! Trusty Lonely Planet, (and I do love those guys! ), would have us believe that this tiny beachside town would be bustling with inebriated surfers and cheesy beach bars and so we planned to depart after 3 nights here. The reality was an enrapturing, hazy set of wide sandy bays which could only be described as vaguely bustling on weekend nights, and so if you only want to take in two destinations on your trip a week languishing in Tofo would be time well spent. 'Casa John', our traditional and luxurious African lodgings, sits at the end of a dramatic rocky outcrop with arresting views of the Indian Ocean. A pleasant 25min beach walk away in neighbouring Tofinho and at the end of a long row of equally inviting lodges, we were treated to the brightest of dawns, starriest of skies, crashing waves and unmatched tranquility day and night! We watched humpback whales breach from our balcony, washed hand-dived prawns down with local beers in beachside cafes, swam with whale sharks and sunfish and mingled with the divers and communities of hippies that are drawn to magnetic Tofo. By night we savoured the colours of dusk with South African wine, devoured Portuguese hot-stone beef and partied with the locals alfresco at Hotel Tofo Mar’s weekly live music event, where everyone gathers. From 'Peri Peri Divers' to 'Casa Barry’s Beach Lodge', 'Dino’s Beach Bar', 'Casa na Praia', 'Brankos' and 'Casa de Comer' Tofo charmed, chilling our London souls right through, and we were so so sad to leave. We wanted an authentic African experience and Morrungulo Beach Lodge delivered whether we were ready or not! Approaching the lodge, neither of us could remember why we'd booked 2 nights here, as the drive to our final destination was indeed broken up by this stopover but the isolation and jungle immersion was more than I had bargained for - despite the website making things absolutely clear! We arrived to find ourselves alone in the most beautiful rotunda style house complete with panoramic cliff-top views, however incomplete in windows. Bamboo bars in place of glazing gave me a slight sense of unease, and sure enough we encountered our first jungle spiders later that night whilst trying to calm the nerves with a glass of wine and some Bananagrams!! Peeling myself from the roof I slept with one eye open though safely inside the bed nets, and by morning was feeling much more confident until we met the lovely Zimbabwean owner who regaled us with tales of much worse creatures to fear than the mere temporary paralysis-inducing ones we had overcome the night before. Deciding to embrace my inner intrepid African adventurer anyway (Mozambique was my idea after all! ), we spent the day marvelling at the views from the cliff-tops and lounging on the deserted Castaway style beach. The early black of night that East Africa forces upon you meant an early night was the best option in this sleepy locale, so r&r is well catered for if that's what you need! After a final outdoor shower with a froggy friend the next morning, we waved goodbye to rustic charm and prepared our minds for a luxurious last few nights further north, hoping for glass windows and other humans just a little..! On reflection, it was Morrungulo that opened my eyes to the impact of a tourism-reliant country suffering the effects of a corrupt government letting it down, as we were told this place was normally bustling with South African visitors who were boycotting due to recent bad press. More of that to come as we continued our journey. The culmination of African beach bliss was found at our most northern stop, still only around 1/3rd of the way up the seemingly endless Mozambican coast, in Vilankulos. The most resort-based of our stays, we didn't spend any time in the town as it's simply not what you come here for, we were ready to enjoy the delights of the magnificent Bahia Mar. Specifically set atop the low lying dunes which trip dreamilly into the Indian Ocean, the Bahia Mar provided the type of 5-star treatment our travel budgets would not usually afford, and as a gateway to the unsurpassable Bazaruto archipelago was the perfect place to park up Suzi and give ourselves wholly to African zen. We sunk into sunloungers, sipped Pina Coladas and savoured every culinary option on the menu whilst listening to the tradewinds lightly rustling palms overhead. Our sea-view room delivered on every level, and tucked away from the main building down the dunes, was the perfect spot to totally check out from reality. Snorkelling on the archipelago is the absolute must-do here, and so the next day we headed out with local company Dolphin Dhow to see what we could see! We lucked-out and ended up with a private trip when the others booked didn't show, and our guides were full of pride. I snorkelled for the first time ever and we spotted everything from dolphins to flamingoes and blue starfish to Nemo. The islands of the archipelago were beyond-imagination beautiful, and eating home cooked lunch on the hot sand unforgettable. The next two days were spent lounging by the pool and indulging in the spa, swimming up for cocktails from time to time and making sure we had our fill of those delectable prawns we'd developed an obsession for by this point. All too soon it was time to leave. Since our flights were booked from Maputo on the return leg, we sadly had to hit the road once again and head south ready for our departure. To break up the journey we booked one last night, finding an enchanting spot by the Nhambavale Lake at the Naara Eco Lodge and Spa - which seemed like just the remedy for our homeward-bound blues, and it really was! Trusty Suzi, our beloved 4x4, bounced up and down track to bring us to yet another taste of peaceful paradise. Naara was nestled in the lakeside bush and our accommodation for the night was a beautiful safari tent carefully integrated with a concrete base and with mesh windows to provide the perfect balance of african nature and western home comfort. Yet again our time here was all to short, and you could easilly while away a week here indulging in the eco spa, rowing around Nhambavale and chilling in the ultra zen open-fronted restaurant which reminded me of an Ibizan yoga retreat. Waking up to sunrise our journey back to Maputo beckoned, and with heavy hearts we waved goodbye to magical Mozambique, taking in every sight and sound on offer as we wound our way back down the E1 to the capital. Our travels complete, we had not once encountered any safety issues, had found the roads easy to navigate and the people to be amongst of the friendliest either of us had encountered anywhere in the world. If you're looking to break the honeymoon mould, escape off the beaten track and experience authentic culture beyond the borders of traditional resort-based getaways, then a self-drive trip to this East African jewel is most definitely the one to deliver - and if diving and ocean life is your thing then you won't find much better! It's finally here! Our first foray into ready-to-wear bridal has come to life and we're super excited that you're here to see it! The shoot took place at the rare and wondrous Wilton's Music Hall in East London, and we had the dream team of Cat Parnell doing hair and make-up, Holly Broomhall photographing and the stunningly cute Caroline Raymond expertly modelling our new styles. As if that wasn't enough, we were lucky enough to borrow some beautiful accessories to really bring our concept to life. You can find all of the details. We'd like to say an enormous thank you to everyone who helped to add these special touches to the shoot, and for those of you in search of make-up services, jewels, hair accessories and flowers... here's your crack team! Gold Geometric Lariat Necklace by A Weathered Penny - We wore it backwards! Hair by Cat Parnell using golden grecian combs by What Katy Did Next. Eucalyptus bunch by Scarlet & Violet London. Wild bouquet by Scarlet & Violet, luxury London florists. Peach tassel necklace by A Weathered Penny. Jewelled hands with Bill Skinner and A Weathered Penny. We were beyond excited when midway through the development of our first ready-to-wear collection, the super-talented Cat Parnell from Unveil asked if she could borrow some of our new styles for a photoshoot. Cat wanted to create some images for her utterly gorgeous new bridal make-up agency offering make-up and hair services to fashion-forward brides. This became our first peek at the RTW collection coming to life, and the pictures are just dreamy! The campaign was shot by the awesome Holly Broomhall, and the same team worked with us on our lookbook shoot a few short months later. If you haven't secured a make-up and hair team for your big day yet then you simply must call upon Unveil. We'd like to look this naturally glowing every day! Follow Cat and Unveil for daily inspiration and her clever tips and tricks for bridal beauty here; Cat Parnell and Unveil . Accessories were supplied by the very lovely What Katy Did Next and Rosie Willett, with flowers by Kate Alban Davies and all expertly modelled by Sara Raouf and Ianthe Rose. All the feels!